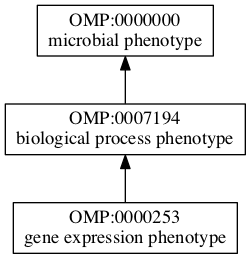 xref: FYPO:0000142 "gene expression phenotype"
comment: This is a high-level term whose primary purpose is to organize terms beneath it in the ontology, and we expect that it will not be used for direct annotations. Please consider using a more specific term to annotate each phenotype. See Help:References for how to manage references in OMPwiki. Pages in category "OMP:0000253 ! gene expression phenotype"
This page was last edited on 8 July 2018, at 02:02.